Addressing trauma’s impact on relationships, behavior, and academics so ALL Kids can learn! Almost half the nation’s children have experienced at least one or more types of serious childhood trauma, according to a recent survey on adverse childhood experiences by the National Survey of Children’s Health (NSCH). This translates into an estimated 34,825,978 children nationwide, say the researchers who analyzed the survey data. In the U.S. there is a high prevalence of Adverse Childhood Experiences (ACE) with some demographic groups reporting as high as 29% on a particular ACE, translating that into 1 out of 3-4 children affected. The main categories are – 1) abuse, 2) neglect, and 3) household challenges (household member with substance abuse, mental health, criminal, or violent behaviors). Two-thirds of all participants in the study (Remember – these are adults in the study) had at least one ACE and more than one in five reported three or more ACEs. The more adverse childhood experiences, the more likely one will suffer from physically debilitating health disease like liver, heart and lung diseases, mental health issues, and even earlier death. The CDC explains “Study findings repeatedly reveal a graded dose-response relationship between ACEs and negative health and well-being outcomes across the life course.” A graded dose-response relationship means, the more adverse childhood experiences one has, the higher the occurrence of a health complication or early death. The third and perhaps most disturbing finding had to do with the negative impact on a child’s brain. When a child endures three or more ACEs, neurological development of the brain is disrupted causing delays in normal growth and learning. Childhood adversities increase as a child grows older, and decrease as family income rises. Nevertheless, ACEs are still experienced by more than one in three children under the age of six. Even in higher income families, more than one in four children have ACEs. 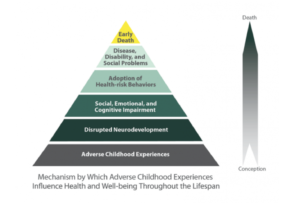 Some of the most startling findings of the ACEs study are that adults who had three or more adverse childhood experiences as defined in their survey, were highly likely to have major health problems and a shorter life expectancy as shown in this pyramid graphic from CDC.gov. Neurological disruption means that children who experience fear as a way of life operate in survival mode and are unable to regulate their heightened levels of arousal and emotional responses. Many factors influence individual reactions to stressful events, making behaviors and responses look like a lack of interest, immature, unpredictable, or explosive. The problem is our response to what we perceive to be “inappropriate behaviors” on the part of the child. The fact is, a child will do well if he can. If a child is not doing well, we educators need to recognize that the child lacks the skills needed to meet our expectations. For children whose brain growth and past learning experiences have been adversely affected by trauma, we need to change not only our reaction to a problem behavior, but change how we plan our lessons and interact with our students. The punitive model in most school’s code of conduct and behavior modification strategies used in classrooms are not only ineffective; it simply does not resolve the problems children with trauma have. In fact, a zero tolerance response to behavior problems can cause them to escalate. In my trainings and as part of my consulting work, I show teachers and their principals simple techniques to get to the heart of the student’s behaviors. Teachers learn responses to replace those old practices that don’t work. As a result, teachers see nearly instant improvement in classroom behaviors, student motivation and engagement. These simple techniques are aligned with brain research and those who receive training from me learn why these techniques work and punitive methods don’t. Childhood trauma needs to be understood and addressed in the classroom before teachers and their principals see improvement in academic performance or behavior. For more on training for your school, visit http://whitewaveseducation.com or call White Waves Education Consulting at 716-440-4189.